(Discussion) IAS Mains - General Studies: Ethics "Write a short note on different views of utilitarists and governance." (Discussion) IAS Mains - General Studies: Ethics "How can rich states help poor countries?" 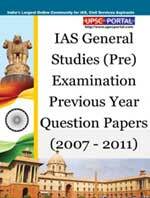 (Sample Material) IAS Mains PUB-AD Online Coaching: Introduction "Evolution of the discipline and its present status & New Public Administration"
(Sample Material) CSAT Online Coaching : Basic Numeracy "Probability"
Based on the result of the written examination held by UNION PUBLIC SERVICE COMMISSION in December 2012 and Personality Test subsequently in August 2013, the following are the lists, in order of merit, of candidates who have been recommended for appointment to the following posts of category I and Category II. It is a well known fact that management plays a vital role in shaping the future of any organization as the optimum utilization of all resources hinges upon the efficacy of the management. The core of a successful management lies in its Clarity of Vision, Plan of Action and more importantly Execution of the Plan of Action – the real gamut of operations as it were, and it is here that the importance of Corporate Governance and Ethics comes into being. Our Hon'ble Prime Minister, Dr. Manmohan Singh has said that whereas our policies and systems are good but the implementation needs much to be desired. Organisations are managed by Policies, Guidelines and Systems. These are dynamic instruments, and therefore need to be reviewed from time to time to gauge their efficacy to the said organization. This review is all the more necessary when a lapse or an untoward incident takes place. It could happen that the review undertaken reveals that the said policy is very much sound and in place, however over a period of time wrong practices have come into being, and which are the reasons for the problems that have occurred, therefore corrective steps need to be taken forthwith A review could also reveal that the problems have occurred in spite of the policy in place, and which means that the policies would need to be modified or amended as the case may be in the best interest of the organization. Former IAS officer Chhatar Singh has been appointed a member of Union Public Service Commission (UPSC). Singh has been appointed for a period of six years or until he attains the age of 65 years, whichever is earlier, said a notification issued by the Ministry of Personnel. Discussion Topic: Write a short note on different views of utilitarists and governance. Discussion Topic: How can rich states help poor countries? 1. A bag contains orange flavored candies only. A girl takes out one candy without looking into the bag. What is the probability that she takes out an orange flavored candy ? Ques. 1 What is professional tax? Ans. Professional tax is levied by state governments or local municipal bodies and is in addition to the income tax that the central government collects. Constitutional amendment is required to enable any increase in professional tax to amend Clause 2 Article 276. Article 276 of the Constitution empowers the state to levy the tax in respect of profession, trade, calling and employment, but it also fixes the ceiling that can be amended only through the Constitutional amendment by Parliament. Currently, 24 Indian states collect revenue through this source and most of them have already imposed the maximum permissible levy of Rs. 2,500 a year. Uttar Pradesh, Uttaranchal, Jharkhand and Arunachal Pradesh are the only exceptions and have not levied professional tax. READ NCERT BOOKS (SCIENCE, GEOGRAPHY, HISTORY) OF 9-12 CLASS. CURRENT AFFAIRS( ANY MONTHLY MAGAZINE FROM JUNE 2013-OCT 2013. WRITE PRECIS AT THE END ( SUGGESTION .BECAUSE ITS TIME CONSUMING). ATTEMPT EVERY QUESTION IN PAPER-2. What is the best way to prepare current affairs? You are subscribed to email updates from UPSCPORTAL - India's Largest Community for IAS, CSAT, Civil Services Aspirants.